How Can I Tell If a Change is Worth Making? By Kathy Voth / July 27, 2015 / Comments Off on How Can I Tell If a Change is Worth Making? Do you want to know if that fertilizer treatment is working? 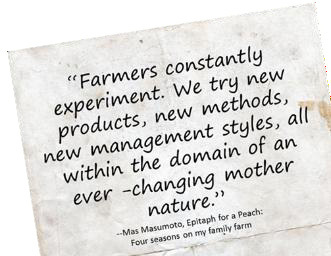 Or would you like to know if a particular management practice is worth implementing on your whole farm or ranch? 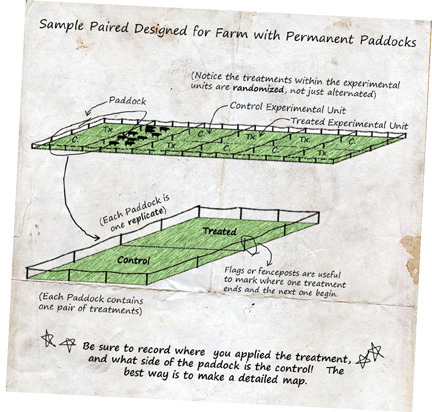 You need to do a little on-farm research, and here’s booklet that can help you get started. Thanks to a project funded by Northeast SARE, the University of Vermont Plant and Soil Science Department has just published a guide for farmers and ranchers interested in doing On-Farm Research. The 15 page handout, A Practical Guide to On-Farm Pasture Research, is a good place to start if you’re thinking about trying a new treatment or grazing practice. It will help you think about the question you’d like the answer to, and how to design a trial to make sure you’re taking measurements in a way that will really help you quantify what is or is not happening on the ground. The part I like best about this booklet is “Step 5: Analyzing Results” where the authors tell us a little about how statistics work and how they can tell us if a treatment really made a difference or not. What we want to know is if any difference we see was caused by chance, or it is actually statistically significant. This section shows us how to use the formula capabilities of Microsoft Excel to run a “T Test” without having to know how to do the math. If you look at this guide and think “Well, I’d love to know the answer to my question, but I don’t know that I have the time to do all that!” think about coordinating with a local NRCS office or your extension agent. Regional SARE offices offer grants to cover the costs of On-Farm research that can cover the costs. If that sounds interesting, here’s a link to learn more.